The diverse ecological regions of the state of Texas support a variety of plant life. Some flowers thrive in the sandy dunes and grasslands of the southern part of the state, while others enjoy the deserts and mountains of western Texas. When grown in Texas gardens, these native flowers require less water, fertilizer and pest and disease control than exotic plants. 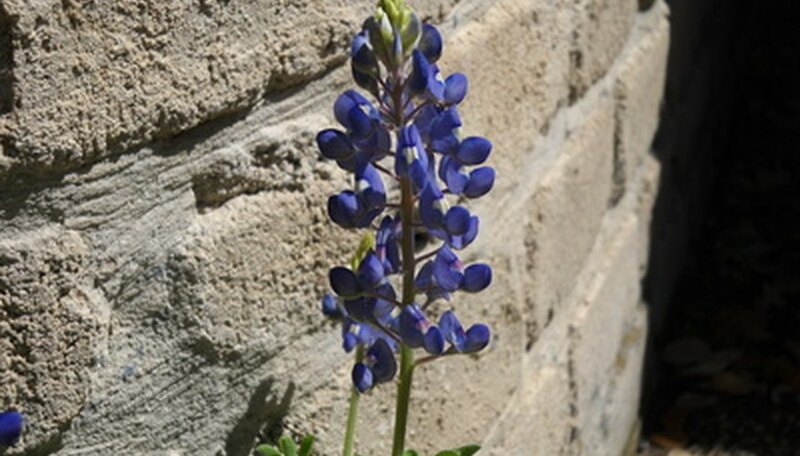 The branching stems of Texas bluebonnet (Lupinus texensis) grow between 6 and 18 inches tall and bear pointed, velvety, pale green leaves. From March through May, the flower stalks bloom with white-tipped clusters of up to 50 blue, pea-shaped flowers. Found growing wild in prairies and along roads in the central region of the state, Texas bluebonnet grows well in most soil conditions but prefers dry, well-drained soil and full sun. The low-growing perennial known as blackfoot daisy (Melampodium leucanthum) only reaches 6 to 12 inches tall but spreads up to 24 inches wide. The stalks of this rounded, bushy plant bear narrow leaves and white daisies with yellow centers. The flowers bloom several times per year, in spring, summer and often again in winter. This drought-tolerant plant grows wild in prairies, plains and meadows in central and west Texas and requires full sun and dry, rocky, well-drained soil. Nutrient-rich soil and regular water may increase blooming but can also shorten the life of the plant. Cut back older plants in late winter to maintain a compact shape. The yellow, star-shaped flowers of Texas yellowstar (Lindheimera texana) grow 1-inch wide and bloom singly or in clusters from March through May, adding early spring color to the landscape. The hairy, thick stems bear a rosette of lance-shaped leaves and reach up to 2 feet tall. Plant Texas yellowstar in full sun and dry, well-drained, sandy or rocky soil. This drought-tolerant annual rarely requires supplemental water. Annual phlox (Phlox drummondii) can grow up to 20 inches tall, but typically only reaches heights of 6 to 12 inches. Clusters of bright red, pink, purple or white trumpet-shaped flowers bloom from March through June, often attracting butterflies. The soft, lance-shaped or oval leaves grow between 1 and 3 inches long. Native to the grasslands and open woods of eastern and central Texas, annual phlox has escaped cultivation and now grows throughout much of the southern United States. It tolerates most well-drained soils but prefers dry, rich, slightly acidic soil and full sun or partial shade. Deadheading faded flowers will encourage another round of blooming.